Briefly, the ‘nudge’ approach draws on ideas around thinking fast and slow and automaticity. It argues that when tired, busy, or just trying to get on with our lives, we tend to do what is easiest rather than what is best for us – even if we know we’d be better doing something else! By designing choice architecture which makes it easier for people to make good decisions, we improve the world1. Consider buying insurance or investing in a pension – most people under-insure and under-invest. Thaler would argue people know what they should do – they just do something else because it I easier or better in the short term. So, lets think about what impact we can have at the point of decision – maybe making it easier for people to apply for a higher value product (by having an online application) relative to a lower value product (for example, by making people print, fill in and post a form via snail-mail). We could make the better decision the ‘default’, or present a direct comparison of the long term outcomes (’best choice for you’ or ‘second best choice for you’ type displays). Another nudge is to just make good choices more accessible – putting healthy foods at eye-level on shop shelfs increases sales for example. Nudges can also involve giving meaning and value to easy but ignored behaviours. The classic example is cigarette but disposal points outside places such a train stations. You can often see these, empty, littered by butts around them. But, ask people a question on the container, and give them a different hole to drop the butts in to ‘vote’ on an answer (and see how others have behaved), and the butts usually end up in the bin! The approach has been hugely influential on policy makers. For instance, former UK Prime minister David Cameron famously set up a dedicated ‘nudge unit’ whose actions including using nudges to increase personal tax receipt payments, and Barak Obama also pulled together an behavioural insight team during his administration. Hold on – isn’t this…? Back to the psychology though – does it all sound familiar? I think so. Thaler’s work is brilliant, and the prize well-deserved in my opinion (not that anyone asked 😉 ). One important implication for the field of economics is it puts to bed (surely!) the idea of rational actors. It draws on social cognitive understandings of information processes, recognises the power of social influence and argues that many if not of our decisions are driven by heuristics and habit. You can see where I am going with this…. Thaler not the first winner of the Economics Nobel to draw on ideas of psychology. Daniel Kahneman won the Nobel prize in Economics in 2002- and he was a straight-up Professor of Psychology. His work on the effects of positive and negative framing of decisions, and ideas of thinking ‘fast’ and ‘slow’ are breathtaking 2 as you can read in his book. It wasn’t long until the pantheon was joined by Elinor Ostrom’s in 2009. Her work on interpersonal and intergroup co-operation in managing resources also remains key reading today (see her classic governing the commons3). Elinor worked as a political economist (she sadly passed away in 2012). So, we know people are not rational. We also know that we have to understand the way they think, why no Nobel prize in psychology? Why no Nobel prize in psychology then? The original Nobel prizes were created in 1901, from the legacy of Alfred Nobel (who got rich inventing dynamite!). The prizes were aimed at physics, chemistry, medicine literature and peace. Economics was actually added as a prize (funded by the banking sector) in 1969 (in memory of Nobel – so it’s Nobel-esque really). 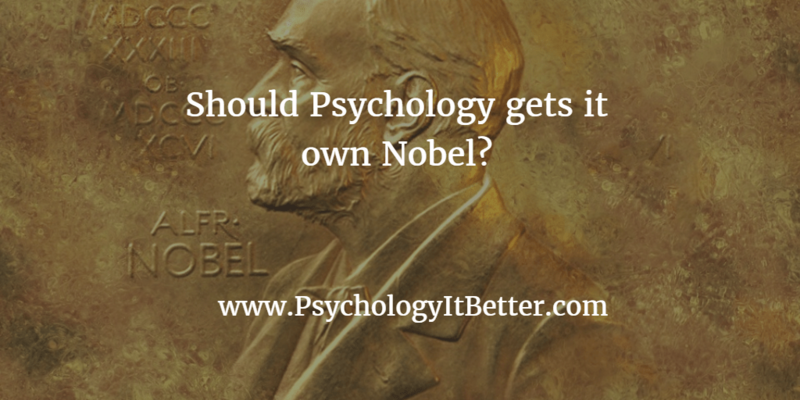 Why no Nobel prize in Psychology? Maybe we can look at other notable absences – such as mathematics. Legend has it that maths was left out of the mix because Nobel’s wife was ‘solving equations’ with a mathematician on the side. This probably isn’t true – Nobel wasn’t actually married, and there is no evidence that his girlfriend was overly excited by algebra. The reason that maths got left out is that Nobel prizes are aimed at people who facilitate practical innovations (like blowing stuff up in Nobel’s case) rather than theoretical advances (like understanding cognitive systems). Much of psychology is very basic science, or small scale interventions. As such, and the opportunities to develop them into world-wide impacts are few and far between. All this is not to say important theory and quick practical advances haven’t been made in the field. I would argue that Gordon Allports work on intergroup contact, for example, guided the the de-segregation of the US school system within a few years of being written. It has also guided every major intergroup reconciliation since to some extent! But, generally, it takes more than a lifetime to go from theory to worlwide action. Nobel prizes are only given to the living, so we are quite often out of luck. When people who are psychologists (like Tversky) or use loads of psychology in their work (like Ostrom and Thaler) it gets recognised for the impact it has on society – via economics. So, maybe a Nobel in Psychology is not going to happen anytime soon. Nevermind – I am happy to co-opt previous economics winners (such as Ostrom and Thaler) as social psychologists – although I am not sure they would agree! I have to admit, I didn’t really pay any attention to Thaler or his work until I read your post. I enjoy economics as much as the next person, but I didn’t pay any attention beyond the headlines when Thaler’s Nobel Prize was announced. After reading your blurb, I decided to look into his work a bit more and requested his book from the library.